Joining of A356 alloy and magnesium was carried out by vacuum-assisted sand mold compound casting process. Experiments were performed as per central composite design method. The second-order regression model validated the accuracy and reliability of experimental results. The interfacial microstructure was assessed by using scanning electron microscope and energy-dispersive X-ray spectroscopy. Phase constitutions were identified by X-ray diffractometer. It was observed that a uniform joint interface of A356/Mg formed with three distinct layers composed of Mg2Al3, Mg17Al12 and Mg17Al12 + δ eutectic structure. Mg2Al3 revealed highest microhardness followed by Mg17Al12 and Mg17Al12 + δ eutectic structure. Brittle and partial ductile fracture morphology was observed on A356 and Mg side, respectively, whereas the middle layer indicated mixed brittle and partial ductile fracture morphology. The process parameters (pouring temperature, vacuum pressure, insert temperature and surface roughness of insert) of compound casting were optimized with respect to the microhardness of joint interface. Optimization was carried out by using response surface methodology (RSM), desirability analysis (DA) and genetic algorithm (GA). A variation of 0.30, 0.84 and 1.35% in microhardness was obtained by RSM, DA and GA, respectively. In transport industry, lightweight fabrication helps to reduce weight and thus saves fuel. Magnesium and aluminum are light metals. These metals are employed to an ever-increasing extent in lightweight fabrication. A number of processes such as diffusion bonding,8,9 friction stir welding,10, 11, 12 laser welding13,14 and metal arc welding15,16 are also feasible to achieve the joining of dissimilar metals like aluminum and magnesium. The joining of Al/Mg by these processes leads to the formation of intermetallic compounds at the interface, which are highly brittle. The preference of using the compound casting process over other dissimilar joining processes renders the formation of a uniform interface zone. At this zone, the liquid metal diffuses into the solid metal by the formation of reaction phases and solid solutions. 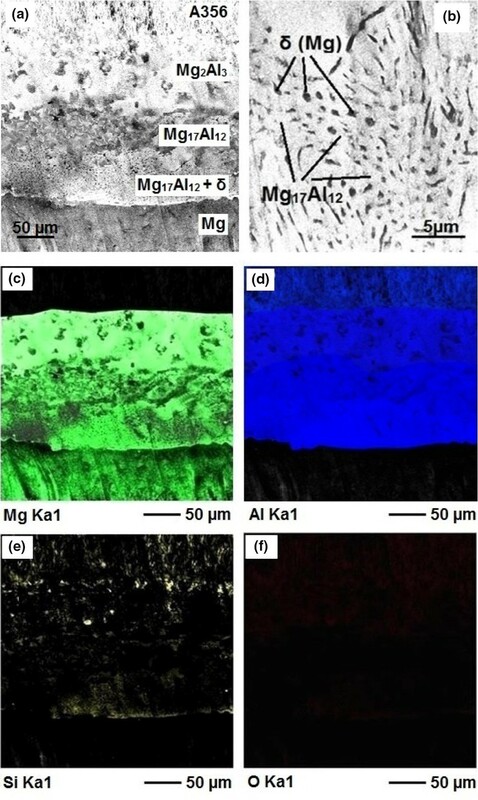 Hajjari et al.17 analyzed the microstructure and mechanical properties of pure Al/Mg compound cast joint interface. The results revealed that microhardness varies between 152 and 221 HV on interface, whereas the base metals like aluminum and magnesium indicated the average hardness of 25 and 28 HV, respectively. 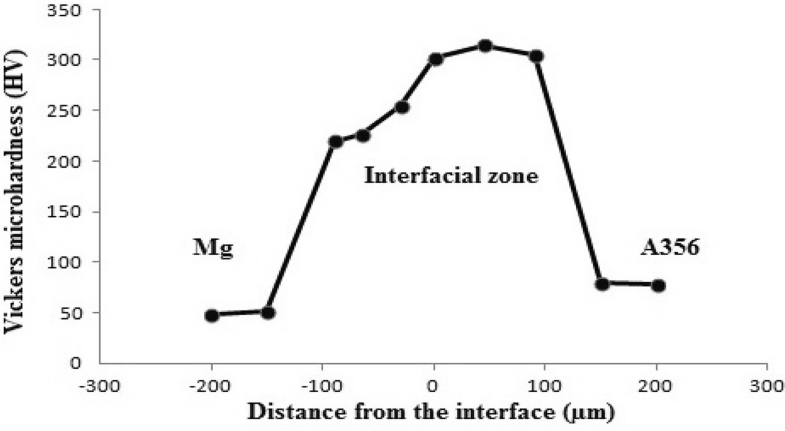 Hardness value of interfacial zone implies the formation of higher hardness Al/Mg intermetallic compounds. Hardness value at the interface near Al side was more than the hardness value near Mg side. However, in the middle portion of interface, intermediate value of hardness was observed. Fan et al.18 reported that joint interface of Al/Mg couple prepared by compound casting process consisted of three distinct layers having Al3Mg2, Al12Mg17 and Al12Mg17 + δ eutectic structure. 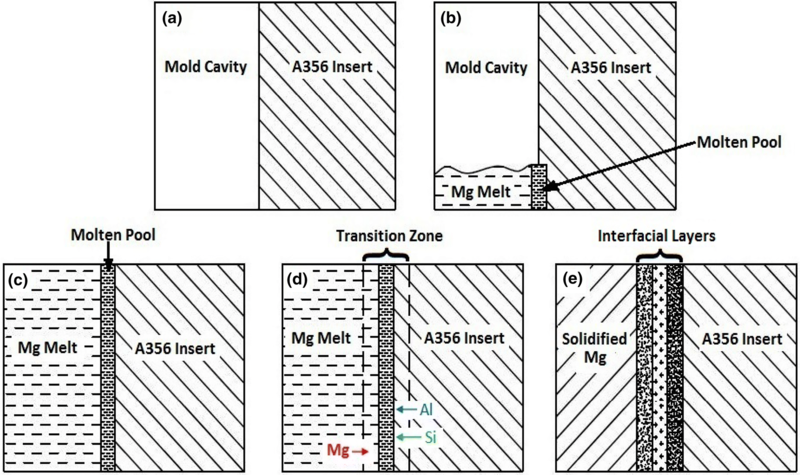 Emami et al.19 concluded that Al/Mg joint interface thickness obtained by lost foam compound casting process was lower than that obtained by conventional compound casting process. Jiang et al.20 investigated that average thickness of reaction layer in Al/Mg joints increased with increasing the melt-to-solid volume ratio. The microhardness of reaction layers with different melt-to-solid volume ratios was observed higher than those of parent metals. Al3Mg2 imparted the maximum hardness followed by Al12Mg17 and then Al12Mg17 + δ eutectic structure. Brittle fracture morphology was observed in Al3Mg2 structure, while Al12Mg17 + δ eutectic structure reflected the partial ductile fracture. A mixed brittle and partial ductile fracture behavior was indicated in Al12Mg17 intermetallic compound. Emami et al.21 investigated that Al/Mg interface formed due to diffusion reaction at lower melt-to-solid volume ratio, while diffusion solidification at higher melt-to-solid volume ratio in compound casting process. The maximum hardness value of 252, 257 and 232 HV was observed corresponding to the melt-to-solid volume ratio as 1.25, 3 and 5.25, respectively. This indicated the formation of an interface with highest hardness corresponding to the intermediate value of melt-to-solid volume ratio. Hajjari et al.22 studied interfacial heat flux which serves as a method of assessing the wettability of solidifying metal and substrate. The maximum interfacial heat flux for Al413 alloy/Mg couple was observed higher than pure solid Al/Mg couple due to the superior wettability at almost all ranges of surface roughness of substrate. Research has been carried out to join other dissimilar materials by compound casting process. Dybkov23 reported that better mechanical properties were achieved by the interaction of stainless steel insert and molten aluminum under controlled conditions. Bouayad et al.24 concluded that two intermetallic layers, i.e., Fe2Al5 and FeAl3, formed at the joint interface when pure liquid aluminum diffused into the pure solid iron. Pierre et al.25 reported that a continuous surface reaction layer formed due to the diffusion of molten Mg/Si alloy and mild steel insert. Zhang et al.26 investigated that wetting and interfacial bonding was enhanced between Al and 1 wt% Sn inserts and Mg melt by using electro-polishing and anodizing surface treatment. Manasijevic et al.27 testified that better bonding was attained in the joint between austenitic cast iron insert and aluminum alloy for piston. 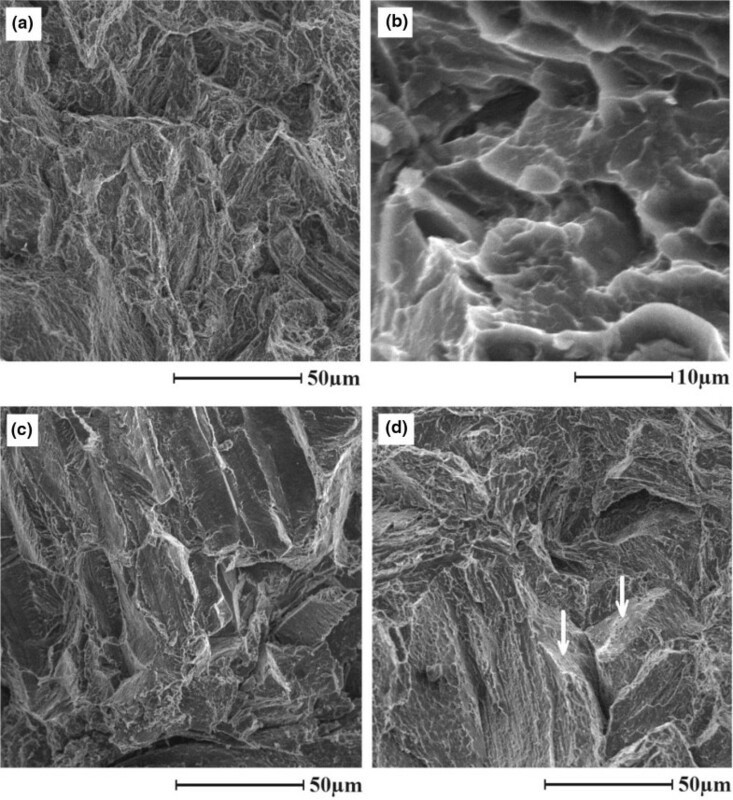 As per the available literature, it seems that evaluation of microstructural characteristics, mechanical properties and mechanism of Al/Mg joint interface formation is still unexplored in compound casting. The study of process controls in compound casting is yet to be carried out. In the present study, dissimilar light materials, A356 alloy and pure magnesium are joined by vacuum-assisted sand mold compound casting (VASMCC) process. The mechanism of interface formation is analyzed by scanning electron microscope (SEM), energy-dispersive X-ray spectroscopy (EDS) and X-ray diffractometer (XRD). Joint strength is evaluated in terms of interfacial microhardness. The optimization of significant process parameters (pouring temperature, vacuum pressure, insert temperature and surface roughness of insert) is carried out to achieve the maximum microhardness at the joint interface with the help of genetic algorithm (GA), desirability analysis (DA) and response surface methodology (RSM). Pure magnesium and aluminum alloy A356 were joined by VASMCC process. Composition of both the materials is given in Table 1. In this process, cylindrical inserts having 20 mm diameter and 115 mm height were machined from A356 ingot. SiC sand papers of 400, 600, 800, 1000 or 1200 grit size were used to grind the cylindrical surfaces. The insert was rinsed with acetone and placed in a horizontal muffle furnace for preheating. Magnesium was melted in a vertical muffle furnace to the designated temperature. 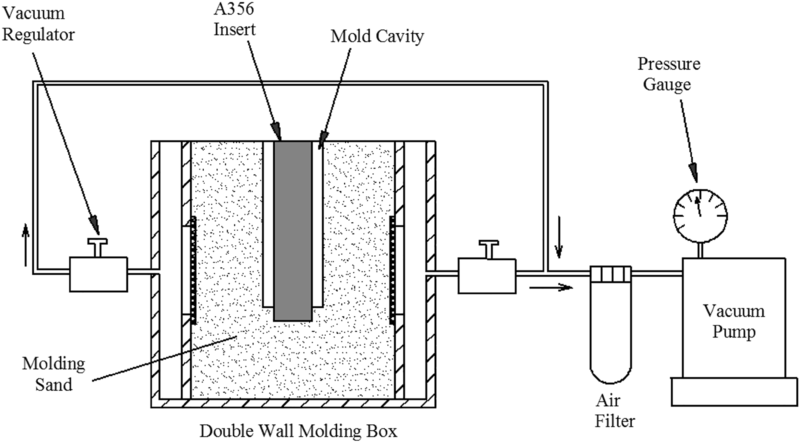 Mold cavity of 30 mm diameter and 100 mm height was prepared with the help of a wooden pattern in double wall molding box. A vacuum pump was attached with molding box. To achieve vacuum inside the molding box, it was covered with a thin polyethylene film. Vacuum levels between 200 and 400 mm of Hg were achieved as per the requirement of experimental runs. Preheated insert was placed in the mold cavity. The molten magnesium was poured around it under MAGREX 36 covering flux. After being cooled to the room temperature, the cast piece was removed from the mold. Schematic of VASMCC process is shown in Figure 1. The compound casting process is influenced by a number of parameters. However, the parameters, which affect the process dominantly, are pouring temperature, vacuum pressure, insert temperature and surface roughness of insert (measured in terms of grit size of sand paper used for finishing the surface of insert). These parameters were taken by conducting the pilot experiments. Table 2 represents process parameters along with their ranges. Thirty experiments were premeditated by using design of experiments approach as represented in Table 3. The experiments were performed to obtain the A356/Mg joints as shown in Figure 2. A356/Mg joints produced by VASMCC process. In order to characterize the microstructures of A356/Mg joint interface, the test specimens were cut and ground with SiC papers of different grit sizes. The specimens were polished and etched with Keller’s reagent. The interfacial microstructure was assessed by SEM and EDS. XRD was performed to identify the phase constitutions by taking a powder sample from the joint interface. The sample was placed in a holder and illuminated with X-rays of fixed wavelength (1.54060 Å). Intensity of reflected radiation was recorded by goniometer. The compounds were identified by analyzing the peaks obtained. In order to measure the microhardness of A356/Mg compound cast pieces across the joint interface, the cylindrical test specimens of 10 mm thickness were cut perpendicular to their axis. The test specimens were ground with emery papers of grit size 150, 320, 600, 800, 1200, 1500, 2000 and 2500 and then finished with the polishing machine by using aluminum oxide powder. Vickers microhardness at joint interface was determined by using ‘Mitutoyo’ hardness tester with 50 g test load and 20 s holding time. Determined values are represented in Table 3. Mechanism of VASMCC process: (a) insert position before pouring, (b) pouring of Mg, (c) formation of molten pool, (d) diffusion of elements and (e) solidification and formation of interfacial layers. (a, b) Interfacial microstructure of A356/Mg joint; EDS map of joint having distribution of (c) magnesium, (d) aluminum, (e) silicon and (f) oxygen. XRD pattern of A356/Mg joint prepared by VASMCC process. A descriptive EDS map of Mg, Al, Si and O elements is shown in Figure 4c–f. As can be seen, the layers adjacent to magnesium and aluminum are rich in magnesium and aluminum, respectively. At the middle layers, a concentration gradient of magnesium and aluminum elements exists. The magnesium content (green) gradually decreasing across the interface from bulk magnesium to aluminum, and it is exactly vice versa for aluminum (blue). Moreover, it can be seen that silicon (yellow) is dispersed throughout the joint interface. Microhardness at A356/Mg joint interface lies between 217.56 and 322.15 HV, while 48 and 78 HV at base metals magnesium and A356, respectively. It indicates that microhardness of joint interface is comparatively higher than the parent metals, which is consistent with other findings.19, 20, 21,32 The microhardness distribution among the joint interface is shown in Figure 6. As can be seen, the interfacial microhardness toward Mg side has minimum value where Mg17Al12 + δ intermetallic compound is formed. It indicates a partial ductile fracture as shown in fractograph (Figure 7a, b) due to its lower microhardness. On the other hand, obvious cleavage planes as shown in Figure 7c clearly indicate brittle fracture morphology on A356 side due to the presence of hard and brittle Mg2Al3 compound. Middle portion of interface indicates microhardness gradient where Mg17Al12 is formed as major constituent along with Mg17Al12 + δ eutectic structure. Figure 7d indicates a partial ductile failure due to plastic deformation and an evidence of cleavage planes shown by arrowhead indicates the brittle fracture morphology. This type of mixed fracture morphology is obtained by the presence of hard and brittle Mg17Al12 intermetallic compound and partial ductile Mg17Al12 + δ eutectic structure. Microhardness distribution along A356/Mg joint interface. Fracture surfaces of A356/Mg joint (a–b) partial ductile fracture, (c) brittle fracture and (d) brittle and partial ductile fracture. ANOVA after neglecting the insignificant parameters for microhardness of joint interface is shown in Table 4. The P value (Prob. > F) less than 0.05 shows model terms are statistically significant at 95% confidence level. The model F value of 1305 implies that the model is significant. It is desirable as it indicates that the terms in model have the significant effect on the response. In the present model, pouring temperature (PT), vacuum pressure (VC) and grit size of sand paper (GS); interaction effect of pouring temperature and vacuum pressure (PT.VC), pouring temperature and grit size of sand paper (PT.GS), vacuum pressure and insert temperature (VC.IT), and second-order term of pouring temperature (PT2) and vacuum pressure (VC2) have the significant effect. The rest of the terms are insignificant. The lack of fit is not significant relative to the pure error, as it is desired. R2 is the ratio of variability explained by the model to the total variability in the actual data. This is used to measure the goodness of fit. The value of R2 as unity indicates the best result in terms of model. The calculated value of R2 (0.998) verifies that the relationship between the selected process parameters and response (microhardness) can adequately be described by the model. The value of predicted R2 (0.9938) indicates a good agreement with that of adjusted R2 (0.9972). Adequate precision compares the range of predicted values at the design points to the average prediction error. It indicates the signal-to-noise (S/N) ratio. S/N ratio greater than 4 implies that the model is fit to proceed further. Adequate precision (167.116) indicates an adequate signal in compound casting process. At the same condition, a relatively lower value of coefficient of variation (0.43%) indicates better precision and reliability of the conducted experiments. Predicated microhardness calculated through Eqn. 3 for all thirty experiments is represented in Table 3. Comparison of experimental and predicted values of microhardness indicates that a similar pattern is followed by experimental and regression model values. The results predicted by regression analysis are quite close to the experimental results. Hence, the obtained second-order mathematical model for microhardness can be regarded as significant for fitting and predicting the experimental results. Figure 8a–c indicates the 3D surface plots which are drawn to investigate the combined effect of process parameters on microhardness of joint interface. (a) Combined effect of pouring temperature and grit size of sand paper on microhardness. (b) Combined effect of pouring temperature and degree of vacuum on microhardness. (c) Combined effect of degree of vacuum and insert temperature on microhardness. It is observed from Figure 8a, b that microhardness is decreased with the increase in pouring temperature. This is due to the fact that as pouring temperature is increased, the solidification time will increase. This leads to the coarse grain structure. A coarse grain structure is accompanied with a low value of microhardness. Figure 8a depicts that as the grit size of sand paper used is decreased (surface roughness of insert increased), the microhardness is increased. This may be due to the wettability behavior of solid insert and molten metal. High surface roughness of insert leads to better interaction of solid surface and molten metal due to which a relatively more uniform diffusion of materials will take place.28 Consequently, the fine grain structure is obtained having comparatively more microhardness. Figure 8b indicates that microhardness tends to increase with the increase in vacuum pressure. The level of compaction of sand aggregates increases with the increase in the degree of vacuum applied. Higher the level of compaction, more will be the effective contact area of sand particles in sand aggregates. It leads to an increased cooling rate, which decreases the dendritic arm spacing.36 Reduced dendritic arm spacing leads to the formation of fine-grained structure. A fine-grained structure is accompanied with the high value of hardness.37,38 Therefore, the microhardness will increase with the increase in degree of vacuum. Figure 8c indicates that there is no significant effect of insert temperature on the microhardness in the presence of other acting parameters (pouring temperature, degree of vacuum and surface roughness of insert). However, at high value of insert temperature (325 °C), the microhardness increases slightly with the increase in vacuum pressure, whereas at the low insert temperature (175 °C), there is a little increase in microhardness with the decrease in vacuum pressure. Similarly, at high vacuum pressure (350 mm of Hg), microhardness increases slightly with the increase in insert temperature, and at low vacuum pressure (250 mm of Hg), microhardness increases slightly with the decrease in insert temperature. DA converts the measured properties of each predicted response into a desirability value d, which is dimensionless. The range of desirability function is zero to one. Zero indicates that the response is unacceptable completely and one indicates that response closely approaches the target value.35 In the present work, optimization is carried out by getting desirable values for the response, i.e., microhardness of A356/Mg joint interface, by using Design-Expert software. Input parameters used in optimization along with their limits and goal settings are represented in Table 5. Fifteen solutions are generated as shown in Table 6. Solution with higher desirability is chosen in order to find the optimal value. The highest desirability acquired in these cases is one. Optimal process parameters as shown in ramp graph (Figure 9) are PT = 663.20 °C, VC = 347.38 mm of Hg, IT = 295.13 °C and GS = 534.41 having the optimal value of microhardness = 324.86 HV. Ramp graph of optimal solution given by desirability analysis. where x(1), x(2), x(3) and x(4) denote the PT, VC, IT and GS, respectively. The fitness function is marked negative to maximize the microhardness as genetic algorithm minimizes all the objectives by default. The actual range of process parameters mentioned in Table 2 is utilized to obtain the effective results by GA. The operating parameters which govern the GA optimization are taken as population size-20, crossover-single point, probability of crossover-0.8, mutation-adaptive feasible and number of iterations as 100, etc. 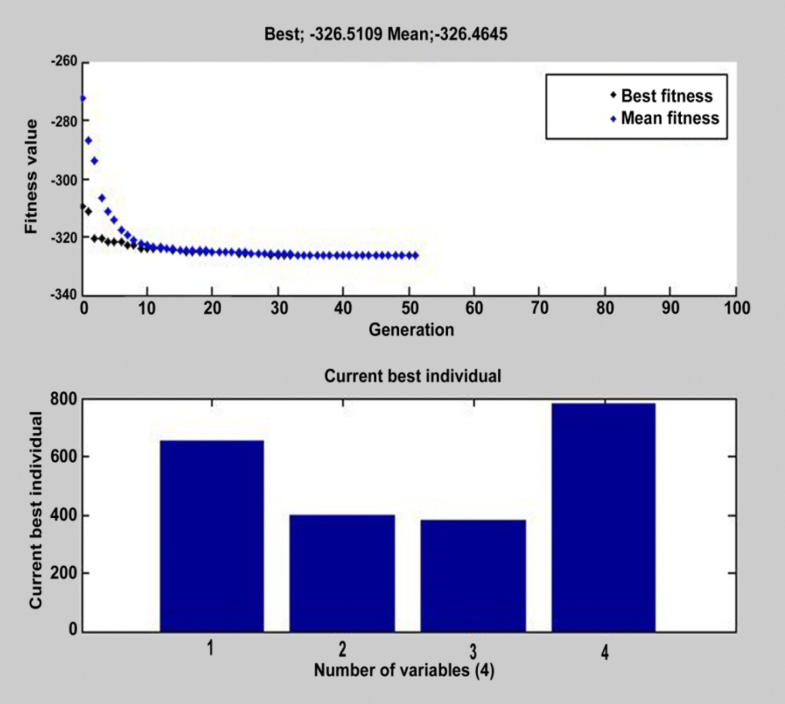 The optimal solution was achieved at 51st iteration having the best fitness value of microhardness as 326.51 HV as shown in Figure 10. The process parameters, which yield the maximum microhardness, are: 650.36 °C pouring temperature, 399.96 mm of Hg vacuum pressure, 377.59 °C insert temperature and 780.93 grit size of sand paper. GA optimization for microhardness of A356/Mg joint interface. Table 7 summarizes the optimal value of microhardness along with optimal process parameters of vacuum-assisted sand mold compound casting process obtained by means of experimental, regression model, desirability analysis and genetic algorithm. The maximum value of microhardness is 322.15, 323.13, 324.86 and 326.51 HV for experimental, regression model, desirability analysis and genetic algorithm, respectively. It is conferred that GA has given the maximum value of microhardness as compared to the other methods. The optimal values as predicted by genetic algorithm for each process parameter lie in the range of actual process parameters. Equation 5 predicted the microhardness as 326.66 HV. It is quite close to the best value of fitness function (326.51 HV) as obtained by GA. It indicates that the optimum value of microhardness can be achieved if applied to the actual compound casting process. GA optimization indicates that the best value of microhardness is obtained at lowest value of pouring temperature, medium value of grit size of sand paper and the highest value of vacuum pressure and inserts temperature. Findings described by 3D surface plots (Figure 8) validate these results. A uniform joint interface formed due to diffusion of magnesium melt and A356 alloy insert. The joint interface consisted of Mg2Al3, Mg17Al12, Mg17Al12 + δ eutectic structure and Mg2Si intermetallic compounds. Microhardness of joint interface was comparatively higher than the parent metals. 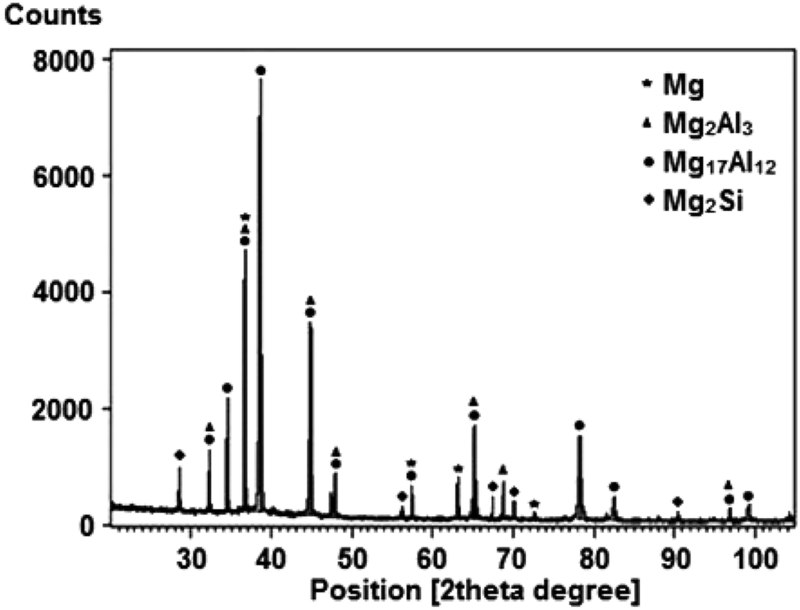 Mg2Al3 revealed highest microhardness followed by Mg17Al12 and Mg17Al12 + δ eutectic structure. Brittle and partial ductile fracture morphology was observed on A356 and Mg side, respectively, whereas the middle portion indicated mixed brittle and partial ductile fracture morphology. 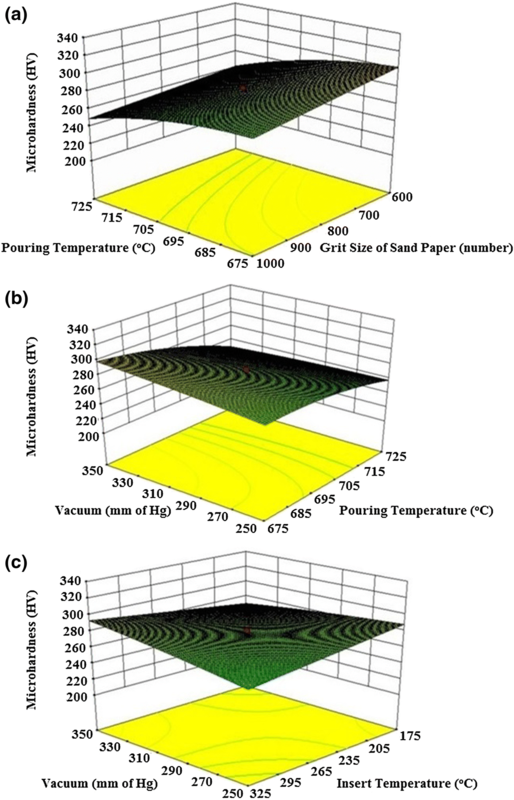 Microhardness of joint interface decreased with the increase in pouring temperature and grit size of sand paper used, whereas it increased with the increase in vacuum pressure. The second-order regression model validated the accuracy and reliability of experimental results. GA proves an effective approach to find the better solution in terms of optimal value of microhardness. Microhardness of joint interface increased by 0.30, 0.84 and 1.35% by regression model, desirability analysis and GA, respectively. The optimal process parameters predicted by GA corresponding to the best microhardness value (326.86 HV) were 650.36 °C pouring temperature, 399.96 mm of Hg vacuum pressure, 377.59 °C insert temperature and 780.93 grit size of sand paper used. In the Introduction it is stated that compound casting is superior to other joining processes. Can the reasons why this is superior be clarified? Please add references. Other dissimilar joining processes such as friction stir welding, diffusion bonding, laser welding and arc welding result in the formation of MgnAlm intermetallic compounds at the interface which are brittle and deteriorate the essential mechanical properties of joint. On the other hand, in compound casting of A356/Mg, one of the layers at the interface is composed of Mg17Al12 + δ eutectic structure which is partial ductile. Due to the presence of this compound, the brittleness of interface zone is lower as compared to the other dissimilar joining processes as mentioned above. Secondly, the operation of joining dissimilar metallic materials in compound casting is very simple i.e., simply pouring the molten metal around the solid metallic insert placed in a mold thus eliminating the long processing time and high operating cost. Parts with complicated shape can be easily achieved by compound casting (please see the References7, 8, 9, 10, 11, 12, 13, 14, 15, 16, 17,30,31). The purpose of this paper is to maximize the hardness of the joint interface. However, it is stated in the introduction that the interface is highly brittle. Would it not be preferential to have a low hardness to prevent brittle failure? The statement in the introduction section is in context with other joining methods such as diffusion bonding, friction stir welding, laser welding and metal arc welding. The joining of Al/Mg by these processes leads to the formation of intermetallic compounds at the interface, which are highly brittle. References have been cited in the manuscript. This paper presents the maximization of hardness, so as to know the value of process parameters yielding the maximum hardness. This may render to select the value of predicted process parameters in practical and industrial applications. Based on Figure 6 it appears that the different types of intermetallic compounds in the interface have different hardness. Could this influence the measurements? How was the value for each casting calculated? Figure 6reflects the variation of microhardness along the joint interface composed of three distinct layers and also for the base metals measured for a single specimen. The hardness values as mentioned in line 36 page 5, are the values for sample number 18 (217.56 HV) and 7 (322.15 HV). These values represent the minimum and maximum microhardness among all the 30 samples. In “Effect of Process Parameters on Microhardness” section, some general comments on this section: There are no measurements of grain size so how can conclusions be made based on this? If the grain size of the intermetallic cannot be measured maybe it could be measured in the Mg to compare the cooling rates? Sudhir Kumar, Pradeep Kumar and H.S. Shan (2008) “Optimization of tensile properties of evaporative pattern casting process through Taguchi’s method” Journal of Materials Processing Technology, 204, 59–69. https://doi.org/10.1016/j.jmatprotec.2007.10.075. S Mohsen Sadrossadat and Sten Johansson (2010) “The effects of solidification conditions and heat treatment on the microstructure and mechanical properties of EN-AC 44400 alloy” Materials Science Forum, 649. 505–510. https://doi.org/10.4028/www.scientific.net/MSF.649.505. 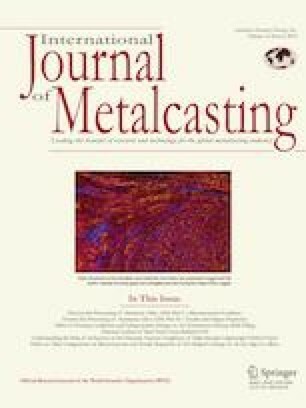 B. R. Jinugu and N. M. Inampudi (2017) “Microstructure, SDAS and mechanical properties of A356 alloy castings made in sand and granulated blast furnace slag moulds” Archives of Foundry Engineering, 17(1), 179–191. https://doi.org/10.1515/afe-2017-0033. Is there proof of a coarse grain structure? The relationship between hardness and grain size true for most metals. Intermetallic sometimes behaves more like ceramics. Would it be possible to measure grain size to prove the statement? Due to the increase in the solidification time i.e., lower cooling rate, dendritic arm spacing is more which leads to the formation of coarse grained structure. A coarse grained structure is accompanied with the low value of hardness. This phenomenon is reported in the research papers as mentioned below. It was concluded that the joint area consisted of intermetallic compounds which is supported by the much higher hardness. However, an intermetallic compound does not grow dendritically and thus have no dendrite arm spacing. The relationship between hardness and grain size is largely due to dislocations piling up on grain boundaries. Does the same happen in intermetallic? Intermetallic compounds tend to be very brittle indicating a different behavior for the movement of dislocations. In the present experimental study, the solidification phenomenon of intermetallic compounds formed at the A356/Mg joint was not investigated in the sense like by using some X-ray tomographic microscopy. Moreover, the interfacial microstructure was assessed with the help of fractograph, SEM/EDS to predict the mechanical behavior in terms of microhardness.